HER BEST YET.I said to my husband recently... I just love the way I feel when I’m reading a Liane Moriarty book. Like I'm surrounded by lovely, neurotic, warm, friends. And Liane has done it again with this wonderful book about nine strangers who go to a health retreat. As always, Liane's observations about life are just so damn spot on. Frances was my favourite guest, but the rest of the gang—Napoleon, Tony, Heather, Ben, Jessica, Carmel, Zoe, Yao... even Masha—I adored them too. I sort of want HER BEST YET.I said to my husband recently... I just love the way I feel when I’m reading a Liane Moriarty book. Like I'm surrounded by lovely, neurotic, warm, friends. And Liane has done it again with this wonderful book about nine strangers who go to a health retreat. As always, Liane's observations about life are just so damn spot on. Frances was my favourite guest, but the rest of the gang—Napoleon, Tony, Heather, Ben, Jessica, Carmel, Zoe, Yao... even Masha—I adored them too. I sort of wanted to go to that retreat ... and then I didn’t. I really didn't. The book is funny and sad and touching, and full of wisdom. All the feels. I feel so lucky to have read an early copy.Five stars. Liane Moriarty's latest offering is a hugely enjoyable psychological thriller that is pure fun and entertainment whilst incorporating a look beneath the issues of a wide cast of characters and the moving stories that lie behind the facade of their everyday lives. Set in Australia, Tranquillem House is a health and wellness resort that many clients claim transformed their lives for the better. The latest batch of arrivals are 9 strangers that get considerably more than they bargained for with the Liane Moriarty's latest offering is a hugely enjoyable psychological thriller that is pure fun and entertainment whilst incorporating a look beneath the issues of a wide cast of characters and the moving stories that lie behind the facade of their everyday lives. Set in Australia, Tranquillem House is a health and wellness resort that many clients claim transformed their lives for the better. The latest batch of arrivals are 9 strangers that get considerably more than they bargained for with their 10 day cleansing programme of diet, light exercise, therapy and spa treatments. It is run by the Russian Masha, a ruthlessly ambitious former company executive whose near death experience led to a complete change in her life direction. Masha had a dark and hidden agenda for her latest customers, driven by the best of intentions, supported by her primary staff members, Yao, and Delilah.Twice married Frances Welty is an established writer of romances whose career has gone into freefall with her latest offering being rejected by the publishing industry and whose boyfriend, Paul Drabble, has disappeared. Ben and Jessica are a troubled married couple who appear to be remarkably well off. Napoleon is a schoolteacher, with his wife, Heather, and daughter, Zoe, the entire family weighed down by grief and guilt. Tony is a former star footballer, who has recently lost his beloved dog, Banjo. Carmel has lost her husband to a younger woman, has four children, and has lost her self esteem and confidence. Lars is a well heeled divorce lawyer, who only represents wives in his word of mouth law practice. As the story progresses, the backstories and issues that lie behind each individual comes to be slowly revealed. The narcissistic, remote and humourless Masha has plans for them which she is certain will truly transform their lives and which will presage a glorious and glittering future with her in the limelight, enjoying global acclaim.There is plenty of sly humour and wit in Moriarty's story of madness and mayhem at a health resort, where people with little in common with each other find themselves in circumstances where they form unexpected bonds and undergo unexpected transformations. The characters are well drawn and distinct, beautifully developed, all with such high hopes for their short stay at Tranquillem House, their interactions with each other are a joy to hehold. There are heartbreaking stories behind some of the characters, including Masha, that become apparent by the end. I found it hard to resist Moriarty's magic and succumbed to this fabulous novel with absolutely no regrets. A fantastic read with plenty of suspense and tension that comes highly recommended. Many thanks to Penguin Michael Joseph for an ARC. https://theburgeoningbookshelf.blogsp...I absolutely devoured Big Little Lies! I love how Liane Moriarty starts a story all sweet with likeable characters, then slowly a foreboding veil comes across the story and people’s dark side begins to emerge changing a good story into a compelling story.Nine people book into a health resort, Tranquillum House, ready to be transformed into a better, thinner, healthier version of their former self.A washed up romance novelist, a family broken by tragedy, a https://theburgeoningbookshelf.blogsp...I absolutely devoured Big Little Lies! I love how Liane Moriarty starts a story all sweet with likeable characters, then slowly a foreboding veil comes across the story and people’s dark side begins to emerge changing a good story into a compelling story.Nine people book into a health resort, Tranquillum House, ready to be transformed into a better, thinner, healthier version of their former self.A washed up romance novelist, a family broken by tragedy, a has-been football star, a young couple whose marriage is faltering, the wife who has been left for a newer model and the lawyer who has commitment issues. Nine perfect strangers all broken in their own way looking for a make-over, a rejuvenation.Then there is Maria (Masha) Dmitrichenko, a Russian immigrant. Masha, the director of Tranquillum House, is a transformation zealot – enlightenment for all. These nine guests are to be the first to start her new regime. Their destinies are in her hands. She is going to change these people, not just temporarily, but forever.I wasn’t sure where this story was going to go. But.....the way it went was never in my wildest dreams what I imagined.Moriarty’s ability to bring out the small idiosyncrasies in each person is extraordinary. She slowly dissects each character, their thoughts, fears and hopes are revealed through her writing. It was easy to see something of yourself in these everyday people.Moriarty has written a novel that delves into the human mind and the way we think and connect with each other, showing an intricate observation of human failings and frailties.The story had my emotions reeling. I could feel empathy for the characters and sadness over their different circumstances. But a sudden shift in the story had my anger rising, which shows how real the characters and the story felt to me. With Moriarty you never know what could possibly happen next.Nine Perfect Strangers is a roller coaster of a read with beautifully developed characters full of insecurities, false bravado and completely relatable. Once you start reading this book it will be hard to put down! Frances Welty, popular romance writer who'd just felt her first rejection, had thought her career and future were assured at fifty-five years of age. The impulsive booking at Tranquillum House, a health and wellness resort (which was expensive), had her questioning her own decisions on the long and tiring drive from Sydney. Her arrival showed her a beautiful old home built in the 1800s, renovated to within an inch of its life, with a staircase reminiscent of the Titanic (in the film with Leonard Frances Welty, popular romance writer who'd just felt her first rejection, had thought her career and future were assured at fifty-five years of age. The impulsive booking at Tranquillum House, a health and wellness resort (which was expensive), had her questioning her own decisions on the long and tiring drive from Sydney. Her arrival showed her a beautiful old home built in the 1800s, renovated to within an inch of its life, with a staircase reminiscent of the Titanic (in the film with Leonardo DiCaprio and Kate Winslet; which made Frances smile) – perhaps she might enjoy it after all.Meeting the other eight guests – Carmel, Tony, Lars, Napolean and his wife Heather and daughter Zoe, Jessica and her husband Ben – felt strange. But even stranger was the fact the course started with five days of silence. Not a word to be spoken; no eye contact – five days! Frances knew that would be difficult. Within that period, there were meditation classes, walking, massage therapy, smoothies and meals, plus free time to swim in the luxurious pool. All to be done in silence.But each and every guest had a secret – and who were the people in charge of the resort? Were the guests comfortable with all that was happening to them? Some were – some most definitely weren’t…Nine Perfect Strangers is the latest by Aussie author Liane Moriarty and wow! How different, how intriguing, how bizarre – how fabulous! I thoroughly enjoyed it, and even with it being almost 500 pages, I flew through it. I can see this one being made into a movie – it would be fantastic on the big screen. I have no hesitation in recommending Nine Perfect Strangers highly, and wish to thank Pan Macmillan Australia for my uncorrected proof ARC to read in exchange for my honest review. I received an advanced reading copy of this book.This was a tough one to put down - nine strangers head off to a health resort, hoping to return home different people. Yes, this was the outcome but the journey they had to get there was not exactly as they planned.Nine Perfect Strangers is going to hit all of her other titles out of the park. It was an excellent read with lots of laughter and What The? moments. It is astounding how supurb Liane's writing can be and this is such a fine example of I received an advanced reading copy of this book.This was a tough one to put down - nine strangers head off to a health resort, hoping to return home different people. Yes, this was the outcome but the journey they had to get there was not exactly as they planned.Nine Perfect Strangers is going to hit all of her other titles out of the park. It was an excellent read with lots of laughter and What The? moments. It is astounding how supurb Liane's writing can be and this is such a fine example of it. Her ability to write the players in the tale and their back stories so that you fall in love with them, no matter their past is so so good. The absolute evil that seeps through the tale is one that we understand and even though we yell at them and ask what are they doing, we know that we will most likely forgive them because it is coming from a place of attempted healing. The interactions between these 9 people and the 3 key members of the health retreat is woven beautifully from beginning to end. Their human failings are brought to the fore and left open for everyone to see and hear and offer opinions on. Your heart breaks and then heals with our new friends.Is it possible that Liane Moriarty is just getting better and better with each book she writes? My answer to that is a resounding yes! This book is light and easy to read - makes for a great beach/holiday read. It may or may not put you off from booking your next health retreat but it will also make you a firm believer in this author and the world's that she creates. I'm looking forward to the next journey. The day I got this book I had to practice utmost restraint not to start reading at 10am. I work for myself, so it was really difficult.I don’t read a lot of chick lit but there are two authors I will make an exception for every time, and Liane Moriarty is one of them.The whole experience was just plain FUN.Nine strangers get together for a 10-day health retreat, one that promises to be transformative beyond their wildest dreams. Some are there for weightloss, others for stress relief and some ar The day I got this book I had to practice utmost restraint not to start reading at 10am. I work for myself, so it was really difficult.I don’t read a lot of chick lit but there are two authors I will make an exception for every time, and Liane Moriarty is one of them.The whole experience was just plain FUN.Nine strangers get together for a 10-day health retreat, one that promises to be transformative beyond their wildest dreams. Some are there for weightloss, others for stress relief and some are not even able to admit to themselves why exactly they are there. Each character is introduced with their own back story and as always, they leap off the page.From ethereal beauty Marsha, the owner, down to frumpy Carmel that will do anything to have another body. I particularly liked Frances and I am sure she will be favourite for most readers. And yes, the book is funny and frivolous but it also had some very poignant moments.I don’t want to say too much as I don’t want to take enjoyment away from future readers. Suffice to say if you want a mini holiday in your head, go read this! I have to give this one 5* for pure enjoyment levels. I can't remember the last time I laughed so much at the same time as being made to consider life so much whilst reading a book.A weirdly wonderful group of utter stranger's all rock up to a 10 day wellness retreat, all looking for different answers, all hoping to come out the other side all brand new. Well be careful what you wish for is all I'll say...This group dynamic is pure dynamite as we slowly get to know this motley crew and their inn I have to give this one 5* for pure enjoyment levels. I can't remember the last time I laughed so much at the same time as being made to consider life so much whilst reading a book.A weirdly wonderful group of utter stranger's all rock up to a 10 day wellness retreat, all looking for different answers, all hoping to come out the other side all brand new. Well be careful what you wish for is all I'll say...This group dynamic is pure dynamite as we slowly get to know this motley crew and their inner selves and life influences. Throw into the mix a fanatical health nut and all bets are off. Nine Complete Strangers is wildly entertaining, extraordinarily thought provoking and beautifully written. You'll find your favourite (mine was undoubtedly Francis, a woman after my own heart) and get entirely caught up in their attempts to heal, their growing relationship with each other and the rather unexpected challenges they'll all face together. I won't give too much away but one moment I was snorting tea out of my nose, the next I was shedding a tear - I was all the way in first page to last. Wonderful storytelling. Highly Recommended. Welcome back, Liane Moriarty! After the disaster (at least to me) that was Truly, Madly, Guilty (the only book I've ever given 1 star to), I was a bit nervous about this one. I loved Big Little Lies & The Husband's Secret and recently loved What Alice Forgot, so I had high hopes but did go in with some hesitation. I'm happy to report I was not disappointed. Nine Strangers come together at a wellness resort, but given that this is a Liane Moriarty book, there's a whole slew of secrets waiting Welcome back, Liane Moriarty! After the disaster (at least to me) that was Truly, Madly, Guilty (the only book I've ever given 1 star to), I was a bit nervous about this one. I loved Big Little Lies & The Husband's Secret and recently loved What Alice Forgot, so I had high hopes but did go in with some hesitation. I'm happy to report I was not disappointed. Nine Strangers come together at a wellness resort, but given that this is a Liane Moriarty book, there's a whole slew of secrets waiting to erupt from this crew. I recommend going in as blind as possible and enjoying what unfolds! I received an advance copy. All opinions are my own. [Update:2018/08/30]Okay, she didn't sign this one. But I'm reading it now. We'll see how this goes.--------------------------------------------------------------------------------Low key waiting for the editor I worked with on Truly Madly Guilty to ask me to translate this. My first Liane Moriarty novel - I was intrigued by this one after the hype surrounding Big Little Lies. This may not be indicative of the quality of her other novels, but I found this to be cliched, predictable and ridiculous. The story focuses on the nine strangers of the title who sign up for a kind of health cleanse at a spa, situated in a remote part of Australia. We quickly learn that something is amiss, and that these people are part of an experience more bizarre and in some ways sinister My first Liane Moriarty novel - I was intrigued by this one after the hype surrounding Big Little Lies. This may not be indicative of the quality of her other novels, but I found this to be cliched, predictable and ridiculous. The story focuses on the nine strangers of the title who sign up for a kind of health cleanse at a spa, situated in a remote part of Australia. We quickly learn that something is amiss, and that these people are part of an experience more bizarre and in some ways sinister than was initially advertised.If you're looking for a quick and easy (although very far-fetched) read then this might be the book for you. However I found myself rolling my eyes at multiple points throughout this story - the characters are stereotypes who come across as pretty one-note, and the twists were not unexpected or shocking (for me, anyway). I honestly just found it very hard to care about anything that happened throughout the book.Thank you Netgalley and Penguin UK for the advance copy, which was provided in exchange for an honest review. Nine Perfect Strangers is one novel where the anticipation more than lives up to the experience itself. For me, this is Liane Moriarty’s best novel yet. Unfortunately, I can’t tell you much about it, because even a hint of spoilers will quite simply ruin the reading experience for you and I don’t want to be that person! 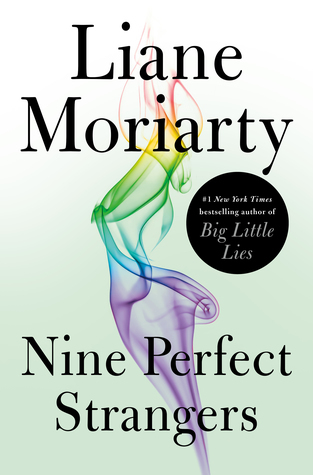 I can however tell you why I think it’s her best and give you a few impressions, which will hopefully be enough of an enticement for you to pick it up and judge for yourself.Nine Nine Perfect Strangers is one novel where the anticipation more than lives up to the experience itself. For me, this is Liane Moriarty’s best novel yet. Unfortunately, I can’t tell you much about it, because even a hint of spoilers will quite simply ruin the reading experience for you and I don’t want to be that person! I can however tell you why I think it’s her best and give you a few impressions, which will hopefully be enough of an enticement for you to pick it up and judge for yourself.Nine Perfect Strangers lacks the ambiguity of Liane’s previous release, Truly, Madly, Guilty, which for me, was a huge bonus. Instead of a constant back and forth alluding to ‘something huge’ – such as in Big Little Lies – Nine Perfect Strangers unfolds chronologically and in the moment. Yes, there is some reflection on past events, but overall it’s styled very different to previous novels by Liane. There is no ‘something huge’, so to speak, more of an experience that is being shared by nine people that is so unbelievably out of the box that it’s this that bonds them, the experience as well as their reactions and connectivity over what they go through. I have to say, Liane blew me away with what she did to her characters in Nine Perfect Strangers. What begins as a stay at a pretty weird health retreat morphs into a truly bizarre scenario that was so violating to these characters – I was horrified. Such a clever storyline, and totally unexpected! There was an element to this novel that I like to call ‘Fargoesque’, and if you’ve seen the original movie Fargo, you’ll know what I mean. That dark humour that borders on inappropriate yet is utterly hilarious while at the same time completely unbelievable. When done well, as it was in this case, it’s priceless.The characterisation in Nine Perfect Strangers was second to none. Each person had a unique presence, a distinctive voice, and while some characters had more air time than others, they all had a valid space to occupy. I particularly loved Frances, with her novelist’s eye and overactive imagination, but then the Marconi family’s story was one that particularly affected me deeply. I could empathise with Carmen, I liked Tony and Lars, and I had a great deal of understanding for Ben and Jessica. I liked them all, I became invested in each of them, and I enjoyed each person’s journey equally. It’s quite a feat, to craft a batch of characters like this, make them distinctive and authentic, yet not have any of them too annoying. And then there’s Masha. Perhaps one of Liane’s best characters yet. At first she was simply intense, narrow focused, a little zealous maybe. But as the retreat wore on, Masha was revealed in all her diabolical, narcissistic, sociopathic glory. She was, to put it simply, unbelievable. Along with Yao, who worshipped her, and was a stunning example of how a normal person with a modicum of intelligence can be taken in by the manipulations of a charismatic leader, Liane has created quite the cast for Nine Perfect Strangers.Filled to the brim with snark and sarcasm, dark humour and witticisms, Nine Perfect Strangers touches on some serious issues, a few that really hit me hard. The burden of guilt, the roles we assume and then never let go of, the human tendency to keep doing what we’re already doing, even if it’s killing us. There’s plenty of food for thought in these pages. To a certain degree, you need to check your reality at the door with this novel, particularly throughout the second half and the ending, but I honestly liked that about it. It was entertaining, thoroughly funny; a marvellous way to spend a weekend. Nine Perfect Strangers comes with my highest recommendation, and if you’re in a book club, this is definitely one you’ll want to add to your reading list.Thanks is extended to Pan Macmillan Australia for providing me with a copy of Nine Perfect Strangers for review. Oh what fun! Liane is one of my favorite authors, and I've read nine of her books. This is now one of my top three favorites by her - the other two being, Big Little Lies and What Alice Forgot. One of the reasons I really like her writing is that she has the ability to create a lot of distinct characters in her stories. Sometimes when writers try to do this, I end up becoming confused with who is who, but she gives everyone a unique background and voice. In Nine Perfect Strangers she introduce Oh what fun! Liane is one of my favorite authors, and I've read nine of her books. This is now one of my top three favorites by her - the other two being, Big Little Lies and What Alice Forgot. One of the reasons I really like her writing is that she has the ability to create a lot of distinct characters in her stories. Sometimes when writers try to do this, I end up becoming confused with who is who, but she gives everyone a unique background and voice. In Nine Perfect Strangers she introduced me to one of my favorite characters ever. I adore Frances, and would love to have her as a best friend. Always honest, not fussed with silly things like weight and very ditsy, she had me laughing for most of the book.And this is another reason I read everything Liane publishes - she has a great sense of humour, but always includes some heavier issues in her novels. In this one, I learned a lot about teenage suicides, and thought she did a brilliant job portraying the grieving parents and siblings feelings.I don't want to give too much away, but highly recommend you try this fun read if you want a break from reality. I think this might be her best one yet. It went from 0 to 100 real quick! Couldn't put it down. Wow, this was such an entertaining read! It totally lived up to the hype, in fact, it exceeded my expectations. I love how the author took a health spa - such a wholesome environment- and gave it a sinister twist. The characters were just wonderful, somehow Moriarty managed to create almost a dozen interesting, multi-faceted people, each with a believable and meaningful backstory, not to mention a unique voice. One rarely reads a book with so many points of view without getting confused, yet I n Wow, this was such an entertaining read! It totally lived up to the hype, in fact, it exceeded my expectations. I love how the author took a health spa - such a wholesome environment- and gave it a sinister twist. The characters were just wonderful, somehow Moriarty managed to create almost a dozen interesting, multi-faceted people, each with a believable and meaningful backstory, not to mention a unique voice. One rarely reads a book with so many points of view without getting confused, yet I never did. I felt like I knew, understood and rooted for each and every character, even the antagonist. Well, kind of, the individual was such a FUN "baddy"! Moriarty has a delightful sense of humour, yet there was certainly no lack of depth. She bravely explores our universal need for actualization, transformation, and meaning, while simultaneously poking fun at our tendency to take ourselves way too seriously. And yes, I know my review contains WAY too many adverbs and adjectives and you will, too, once you have met Frances, my favourite character in this fantastic book. Happy reading! Personally I think this is her best yet, but it certainly has an unusual twist to it, that might shock some people! A fascinating choice of a plot twist, that's for sure. I thoroughly enjoyed it. I bet it isn't what you expect! But I refuse to give anything away, you'll have to make your own judgement. I was in the mood for something fun, and Nine Perfect Strangers did not disappoint! Will ten days at a health spa transform your life? Nine people each sign up for a stay at Tranquillum House - a health spa located in a very remote part of Australia, and give up their alcohol, sugar, electronic devices and more to try and transform their lives. We have Frances Welty, a former best-selling romance author, who has now hit the skids after a scathing review and a broken romance - will she actually g I was in the mood for something fun, and Nine Perfect Strangers did not disappoint! Will ten days at a health spa transform your life? Nine people each sign up for a stay at Tranquillum House - a health spa located in a very remote part of Australia, and give up their alcohol, sugar, electronic devices and more to try and transform their lives. We have Frances Welty, a former best-selling romance author, who has now hit the skids after a scathing review and a broken romance - will she actually give up her soft cushy life and change? How about Ben and Jessica? an uber rich young couple that are now experiencing a crumbling marriage. Also staying are Carmel, a wife whose husband has dumped her for a new trophy wife, Tony, a former Australian football superstar, Lars - a gay lawyer who is struggling with his partner's need to have a child, and family that has been traumatized by the death of a child. Tranquillum House is run by Masha - a stunningly beautiful Russian who has experienced a "near death" transformation, and Yao, her devoted assistant. When Masha delves into some highly unregulated and drastic means to transform her current patrons, the book gets really interesting. I almost felt it went over the top, but all ends well. At first I was a little annoyed by Frances, but in the end, she really redeems herself. This would make a great vacation read, and book club choice. Lots to discuss with Masha's tactics for improvement. Thank you to Netgalley and Flat Iron books for an advanced reader copy. I have read two Liane Moriarty books: The Husband's Secret and Big Little Lies. The stakes of this novel are lower, and with more humor. Nine people go to a health resort, for a variety of reasons, and their backstories and personalities are revealed as this very unorthodox center tests them with different methods.Lead protagonist Frances is a funny, frank, outspoken romance writer facing some failures personally and professionally. A young couple with marriage troubles, a family with a tragedy, I have read two Liane Moriarty books: The Husband's Secret and Big Little Lies. The stakes of this novel are lower, and with more humor. Nine people go to a health resort, for a variety of reasons, and their backstories and personalities are revealed as this very unorthodox center tests them with different methods.Lead protagonist Frances is a funny, frank, outspoken romance writer facing some failures personally and professionally. A young couple with marriage troubles, a family with a tragedy, and a few others come together for these 10 days. I enjoyed it, but can't quite enthusiastically recommend. A fantastic book, bound to generate as much buzz as Big Little Lies did.Moriarty writes the most wonderful, frustrating, fully fleshed out characters that you can't help but empathise with. I thoroughly enjoyed this read! I know others may not agree with me but I think this is Moriarty’s best book yet. She’s written dark, she’s written fluff, she’s written drama and tension. Nine Perfect Strangers is the perfect mix of all and I loved it. That was probably the most bizarre Liane book I’ve read yet. It’s certainly unorthodox and I’ll be interested to see how the general public respond to it once it’s out. Had many moments that made me question what on earth was going on, but it was ultimately enjoyable with loveable characters. One of the things that I really liked most about this book is Liane’s way with irony. There were a couple of points in the book where Liane writes about a slow, thriller of a book that one of the characters are reading. How the story developed slowly, how it is very character driven, how the story doesn’t develop much in the first half and it is all about getting to know the characters and that is exactly what Leiane does in this book to her readers. She makes you work hard to be rewarded at the One of the things that I really liked most about this book is Liane’s way with irony. There were a couple of points in the book where Liane writes about a slow, thriller of a book that one of the characters are reading. How the story developed slowly, how it is very character driven, how the story doesn’t develop much in the first half and it is all about getting to know the characters and that is exactly what Leiane does in this book to her readers. She makes you work hard to be rewarded at the end of the book. It made me laugh and smile while I was reading it. Know that Leiane know that she was manipulating the reader and she had the reader exactly where she wanted them and she wasn’t going to give anything away for free and you have to work with this book and get passed the half way point before the story really kicks off. For me that is very clever and Leiane is a craftswoman if her work. In this book nine perfect strangers find themselves checking into the same health spa retreat. All wanting their lives to change in many different ways. But the all do have some something in common. They are all there for the relaxation, meditation, restoration, luxury, pampering, mindfulness, wellness and peacefulness. But they are also all aware that with great gains comes some hard work and to reap the rewards they have to be willing to put in some hard work of their own. But should they all stay and embrace the spa retreat completely and fully? Or should they all make a break for the hills while they still can? All of the characters in this book have their own secrets, wishes and fabulous personalities. It was really great to see the way that they all interact with each other and all of their stories. As I mentioned before this book makes you work hard to be rewarded. But if you are willing to put the hard work in. You will be rewarded with a good book, sparkling with Leianes wit, humour and mastery of weaving a good physiological thriller. Liane Moriarty’s books start out light and bright with rainbow painted toenails so you are unprepared for when she chops you in the windpipe. She lulls you into a false sense of easy reading with all her charming characters and delightfully placed exclamation marks – so funny! – and then she elbows you in the head. It hurts. Liane does this again in Nine Perfect Strangers. I was enjoying the trip to the health retreat with the amiable lady writer Frances but then found myself sobbing on my bed. Liane Moriarty’s books start out light and bright with rainbow painted toenails so you are unprepared for when she chops you in the windpipe. She lulls you into a false sense of easy reading with all her charming characters and delightfully placed exclamation marks – so funny! – and then she elbows you in the head. It hurts. Liane does this again in Nine Perfect Strangers. I was enjoying the trip to the health retreat with the amiable lady writer Frances but then found myself sobbing on my bed. This book has layers and layers of humour, heartache, insight and compassion. Also, in this book nine strangers go to a spa called Tranquillum House. I would really like to go there… if that’s not giving away too much of myself. This was my first introduction to Liane Moriarty's writing, having been intrigued by the hype surrounding her earlier books and the HBO adaptation of Big Little Lies. And honestly? I'm not entirely sure what I think. While the characterisation was strong (despite myself, I found myself invested in the outcome for the 'nine perfect strangers'), some of the writing made me cringe. There's a chance that the preponderance of adjectives and adverbs was an ironic nod to the character of Frances, a rom This was my first introduction to Liane Moriarty's writing, having been intrigued by the hype surrounding her earlier books and the HBO adaptation of Big Little Lies. And honestly? I'm not entirely sure what I think. While the characterisation was strong (despite myself, I found myself invested in the outcome for the 'nine perfect strangers'), some of the writing made me cringe. There's a chance that the preponderance of adjectives and adverbs was an ironic nod to the character of Frances, a romance novelist accused by her ex-husbands of over-indulging in descriptive language but, if so, it's not something that was successfully carried off. But if you're looking for an undemanding page-turner to read on a sun lounger, this would be a great pick. Advance reading copy read, November release date. Another page-turner from Liane Moriarty, with lots of laughs, suspense, some horror, and great character development. Nine people go to a high-end Australian wellness retreat center that will indeed transform their lives in 10 days, as promised. Definitely one of her best. Great variety in character traits. I’m sure once this is released that readers will enjoy it just as much as her previous novels. Captivating plot that seems to be very modern and set in the heart of Australia which I always love. Well, I opened my Kindle earlier this week and was pleased to find that my pre-ordered copy of the latest offering from Liane Moriarty had been delivered and so - as much as I was enjoying some Annie Seaton - I'll be honest and say I just had to get into this one.. I'm not much for savouring the anticipation. I'm kind of an instant gratification type of gal!Nine Perfect Strangers is a tale about 9 people, who for varying reasons in their life feel they need a "transformation" and so book into a Well, I opened my Kindle earlier this week and was pleased to find that my pre-ordered copy of the latest offering from Liane Moriarty had been delivered and so - as much as I was enjoying some Annie Seaton - I'll be honest and say I just had to get into this one.. I'm not much for savouring the anticipation. I'm kind of an instant gratification type of gal!Nine Perfect Strangers is a tale about 9 people, who for varying reasons in their life feel they need a "transformation" and so book into a 10 day cleanse at a luxury health retreat run by an ambitious Russian Businesswoman who dropped out of the corporate world following her own transformative experience.This was an interesting read - in many ways, the same as typical Moriarty - yet also different. For a good part of the book, I found myself thinking along 3.5 stars.. okay, entertaining - but not mind-blowing!There were the same neurotic characters - ones you loved and ones you didn't; ones that made you roll your eyes or made you shed a tear or made you giggle. Her ability to get into the heart of the character and connect them to the reader is always a stand out for me. The pace starts off slow in comparison to many of her other books - you get to know the characters and feel for them..but wish something would happen. It seemed as peaceful as going on a holiday to a relaxing if slightly quirky health retreat.... and then all of a sudden - IT WASN'T!In true Moriarty fashion, secrets are exposed, intrigue ensues and suspense builds.In the end I think this is possibly the favourite of my books so far - and I've read most of them! Liane Moriarty can write books you can hardly put down, like The Husband's Secret and Big Little Lies, but not all her books are as good as that and unfortunately this is one of the not-so-good ones. While it's still very readable, the story is silly and unsatisfying. It has an enormous build up with not a lot of payoff.The story is about nine people (who incidentally are not perfect strangers - two pairs are married couples and one is someone's child) who go to stay at an upmarket health & Liane Moriarty can write books you can hardly put down, like The Husband's Secret and Big Little Lies, but not all her books are as good as that and unfortunately this is one of the not-so-good ones. While it's still very readable, the story is silly and unsatisfying. It has an enormous build up with not a lot of payoff.The story is about nine people (who incidentally are not perfect strangers - two pairs are married couples and one is someone's child) who go to stay at an upmarket health & wellness retreat for a 10 day transformational cleanse. Over the first half of the book we gradually get to know them all and the emotional baggage that they have brought with them: failing relationships, failing careers, bereavement, personal dilemmas. It's all quite enjoyable to read, but it moves slowly. There's a lot about their daily routine - walks, clean food, spa treatments - and I had no sense of where the book was going or what the point of it was.At about the halfway mark, that all falls into place as we finally understand the unusual intentions and methods employed by the spa's director. The second half is faster paced and we get to know all the participants very well - it's one of those books where everyone gets an epiphany - but what happens feels way too silly and I didn't find anything from this point on terribly interesting.So I don't really recommend it, but having said that it's a long book (almost 500 pages) and I read it in two days. So it's not a complete mess. I love the way that Liane writes and as always she has chosen some topical themes to explore. But the book needed more shape and it definitely needed a stronger storyline to sustain it.